One thing I love about old newspaper ads is how they can tell stories if put in context over periods of time. 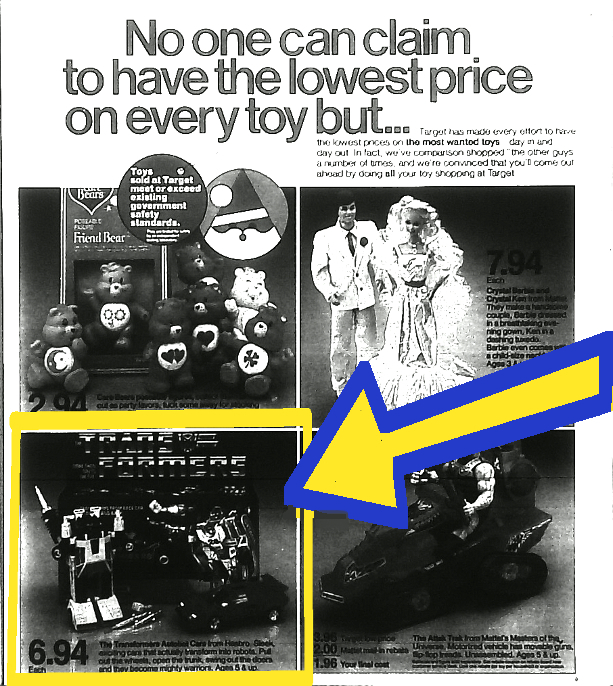 One such story involves a series of Target ads run in late 1984 that illustrate how tough it was to get deluxe Autobot cars that holiday season. The first was run on November 11th and featured a pretty neat setup with the Lamborghini bros Sunstreaker and Sideswipe in front of a Mirage box. 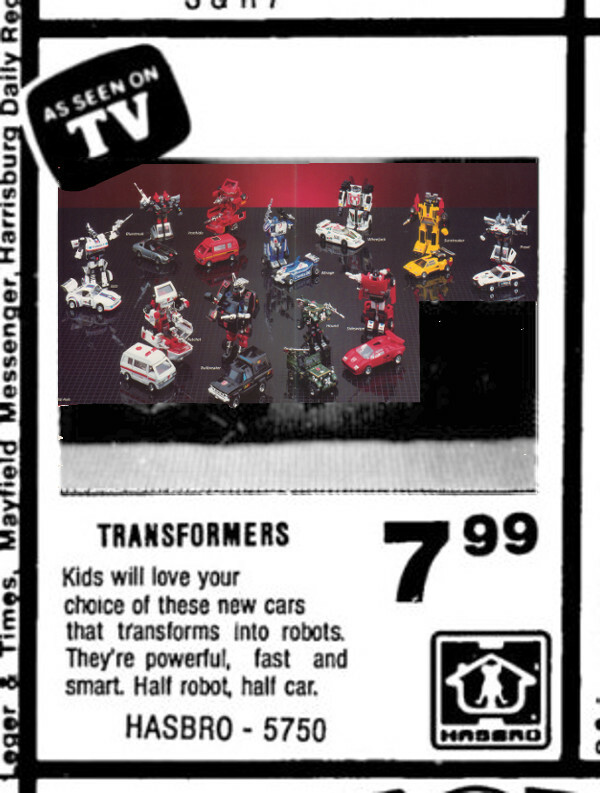 It was a fantastic choice of the sportiest Autobot cars and a really pretty ad if you ask me. 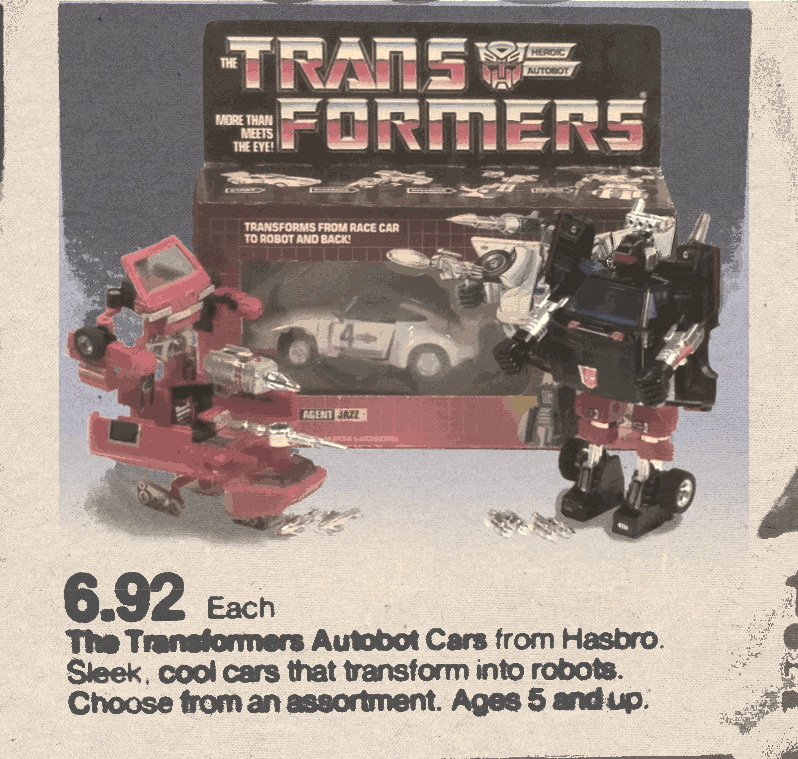 Oftentimes I'll look at an old Autobot ad with the more mundane, boring looking cars like Trailbreaker or Ironhide and I'll wonder if the store really wanted to sell Transformers at all! 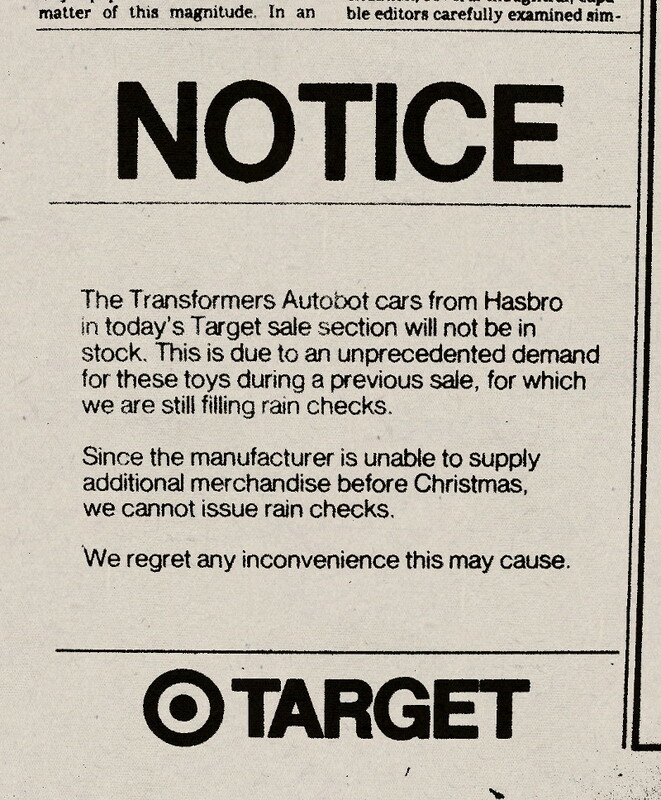 Well the sporty cars of the first ad may have worked too well because when Target next advertised Autobot deluxes on December 5th they had to run a disclaimer in the body of the newspaper. It announced that they wouldn't have any in stock due to overwhelming response from the last sale they were still trying to fill rainchecks for! So here I can glean a little insight into the process of how newspaper circulars were made back then and how demand far outstripped supply that first Transformer year. The circulars obviously must have been planned and photographed well in advance of their distribution in papers. In Target's case it was before they could have anticipated the amount of stock they had on hand. I like how their explanation laid blame for the scarcity squarely on Hasbro who wouldn't be able to deliver more Autobot deluxes in time for the December 5th ad. 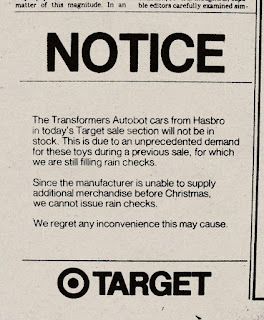 I guess you could say when it came to filling orders for Transformers in 1984, Hasbro completely missed their Targets. NOTICE: Ads in this post are colorized recreateAtrons based on black and white scans and are not the originals (but they're probably pretty close). I wrote once about how in 1986 my mom bought a Matchbox Lion Voltron and hid it in my sister's closet, only to tell me after I found it that my cousin would be getting it instead because I did not deserve it. What I don't think I ever revealed was that along with Voltron she'd also bought a Jazz. A pristine 1984 era possibly pre-rub Jazz. Ever since then Jazz and Voltron have been the physical toy incarnations of unworthiness and shame for me. Psychologically I could never get over my label of being undeserving of those two toys and that has followed me all my life. Even 30 years later I've never bought myself a combining Voltron toy of any kind. 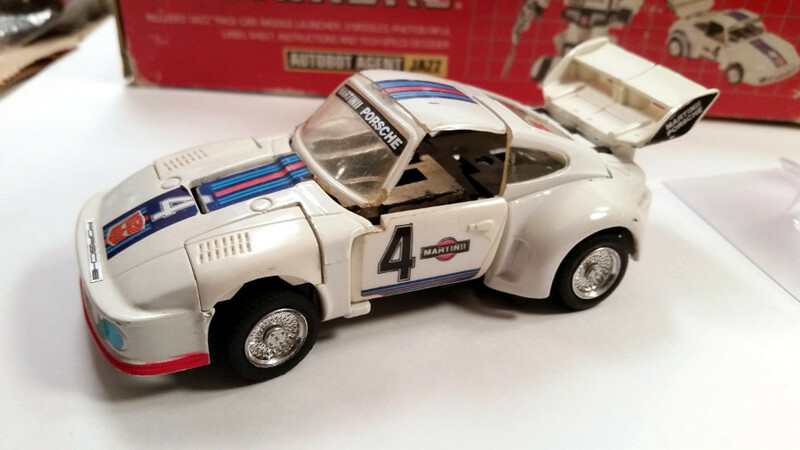 Although I must admit that in my rebellious teens I did buy myself a G2 Jazz when it came out in a Hasbro fueled wanton act of teenage defiance. Yeah I was a wild one in the nineties. 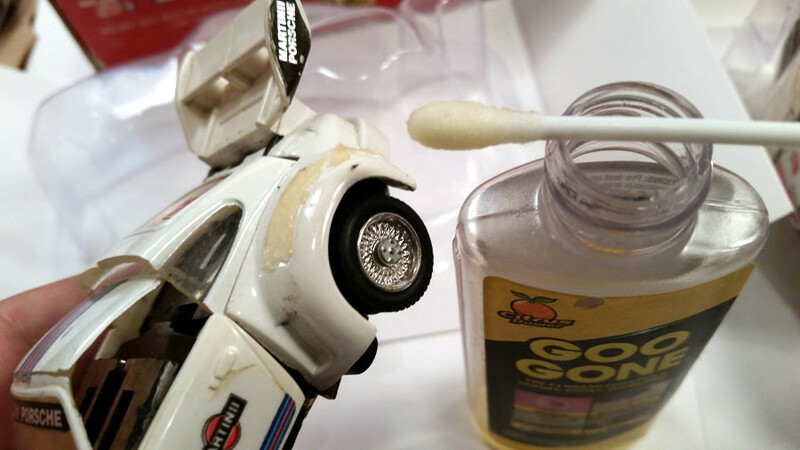 Well now that I've started my new old ad restoration project I found need for a G1 Jazz box. There's a certain ad from Target that I am trying to recreate but in it is a boxed G1 Jazz. My unworthiness be damned, I had to finally get one and move on with my life. 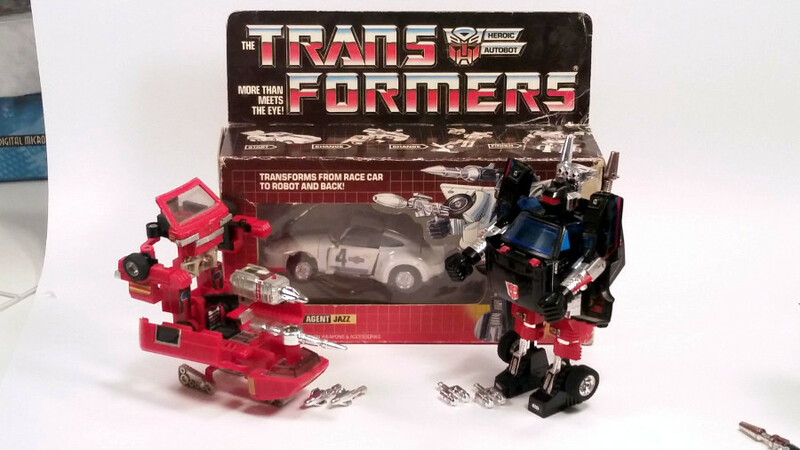 Unfortunately, nice Jazz boxes are expensive even in this age where prices for loose G1 on the secondary market are totally in the gutter. 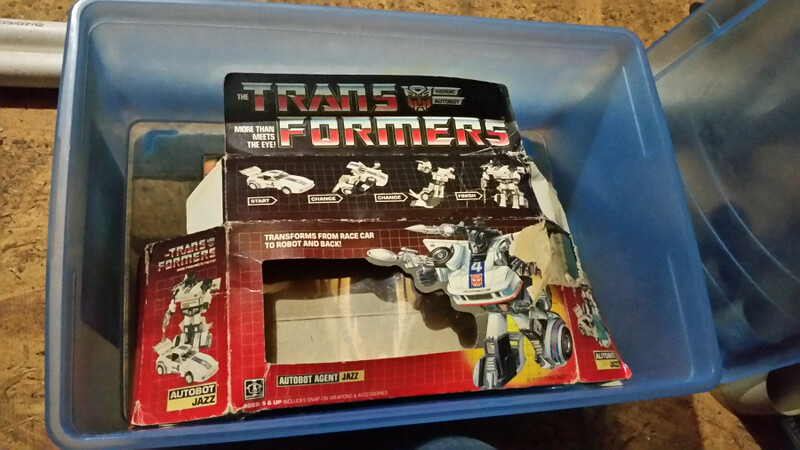 But I did find one auction for a busted up Jazz and its horribly mutilated box. It was as if destiny united me not with the Jazz I wanted, but with the Jazz I could afford. 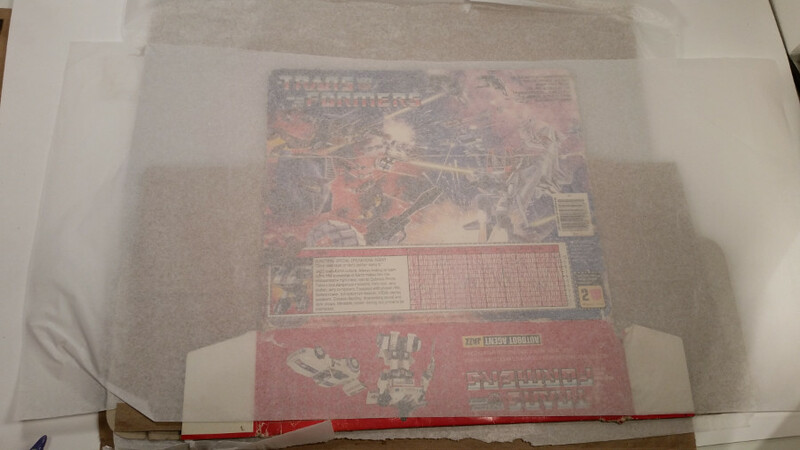 Although it looked like it had been run over by a garbage truck, when I saw the auction photos I figured two things: 1) that even with a gigantic tear in the corner and all smashed up, I could still probably make that box look good enough for what I needed, and 2) considering how I treated my childhood toys, that old 1984 Jazz in my sister's closet was better off without me. The Jazz in my $28 box-and-Jazz auction was in the shape you'd expect for a Jazz that came with a box for 28 dollars. If you know how G1 Jazzes are made, you know that pin lying alongside the body means only one thing-major structural damage. That's the pin that the chest swivels on, so it being outside is a clue that this Jazz had a lot in common with Jazz in Michael Bay's movie. It was actually kind of fun to hold the two halves in my hands and say 'Aww, Jazz' over and over again. One odd thing I noticed was how the obligatory broken windshield was broken. Usually they're broken at the neck, but this one looks like it was deliberately cut at the roof, as if someone were trying to make Jazz a convertible! 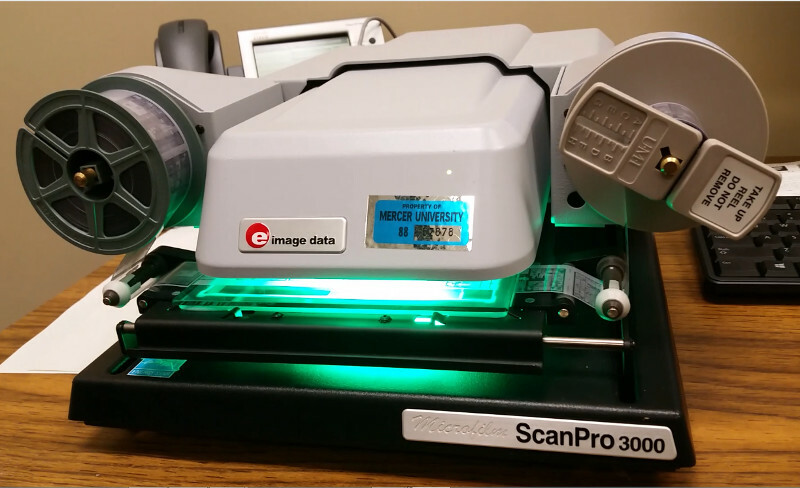 I researched online about flattening old documents and adapted a technique used to unroll rolled up photographs. I put an inch of water in a plastic tub, suspended the Jazz box above it on a platform built from a tv dinner tray and a stack of CD covers, and snapped the lid on. 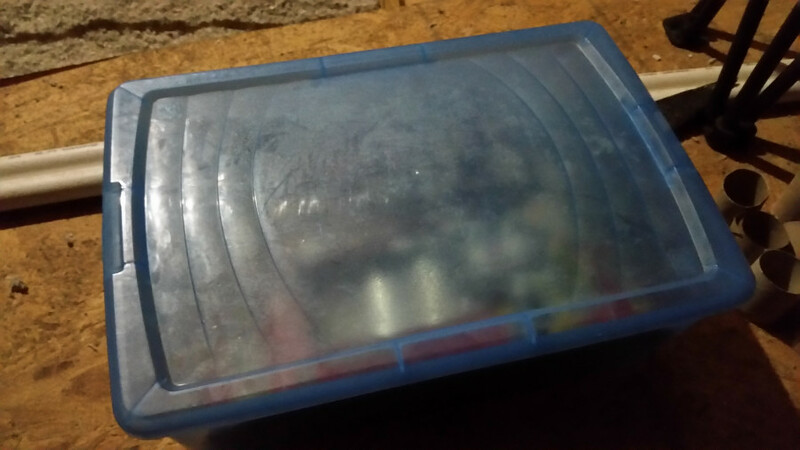 I took the box out after two days. The humidity inside the container caused the paper fibers to relax so the box was really soft and limp. Getting the box flat enough so that it would photograph well was a little bit of a challenge. I've got a couple of messed up Transformer boxes but I've never really tried flattening them out. In Jazz's case I pretty much had to do something because the box wouldn't sit square due to some massive bowing out of the top and bottom panels. It had to be flattened and I had to figure out how to do undo 30 years of whatever forces smashed it into such sorry shape. But I tried a technique involving a mini humidifier and a couple days of drying and flattening and the box flattened nicely. You basically have to get the box fibers to relax by keeping it in a humid environment for a couple days, then you have to flatten it in layers of tissue paper and grocery bags for a couple more. Of course there has to be some weight applied while drying, so I used an entire year's worth of Hobby Japans from 1997. 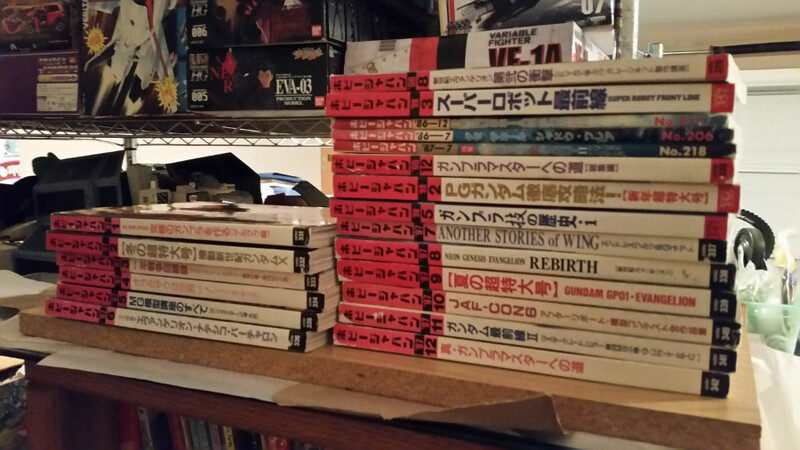 I figured nothing on earth is heavier than a couple thousand pages of super robots. Now that's flat! I've tried flattening out similar materials before without applying humidity but I never got results this flat this fast. Here's the before & after on the box's most damaged corner. It's still total garbage but at least now it's square and flat garbage. Note how the bowing on the top was completely eliminated and the crushed flap edge has totally smoothed out. The rest of the box doesn't look too bad, either. Waviness and major curving have been almost completely eliminated. The worst of the bowing on the bottom panel has disappeared enough so that the box sits square. I can't do much about the whitening on the creases as they will remain even after the bends are straightened out, but this is good enough for physical reality. The rest can be cleaned up digitally when it's time to recreate the ad. The final touches. I determined that the rear quarter panel decals are not factory applied from studying actual sealed Jazzes and the ad I am attempting to recreate. So I removed the one that will show most prominently through the bubble. Speaking of bubble, I bought a reprobubble and insert materials from ebay seller reprobubbles. I had to cut and fold things to fit how I needed them but they worked well. 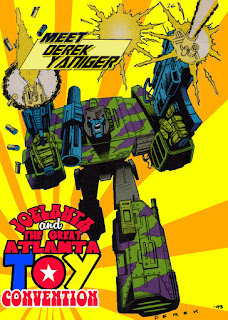 I think so far my attempts at colorizing old Transformers newspaper ads have come out pretty decent. They're kind of tricky to execute but the latest ones I wanted to do were supposed to be a piece of oil cake. 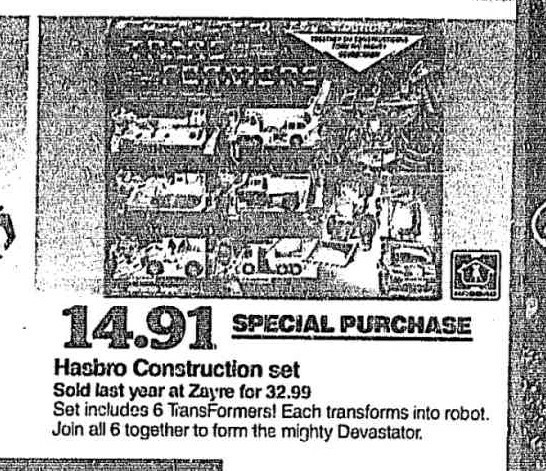 Whereas the Devastator giftset and early Zayre ads required actual toys and photo manipulations, my latest targets should have been straightforward because those ads used existing catalog photography. Since I had the catalog source material I thought it would be a super simple matter of cut and paste and I'd be done. 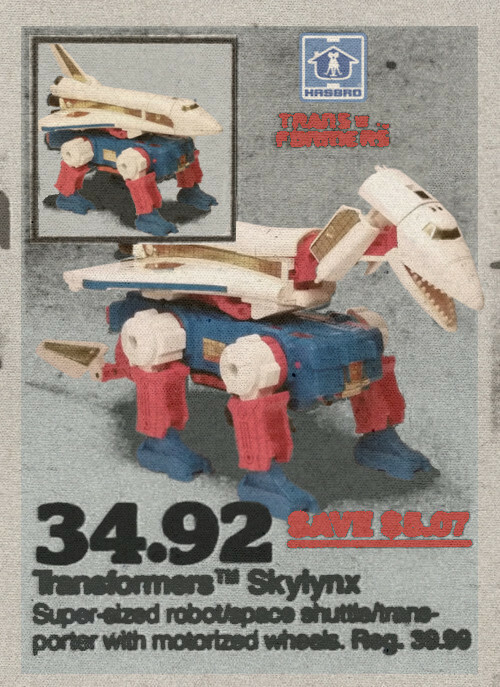 But of course with old Transformers ads nothing is what it seems and colorizing them would be like fishing out Burmese ruby crystals from the La Brea tar pits. 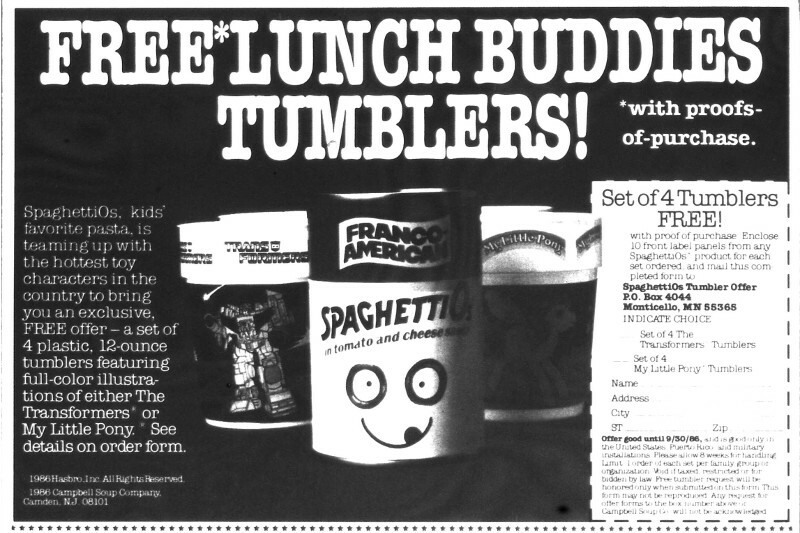 The two ads I wanted to colorize were both from regional chains that ran them as part of their circulars back during the holiday season of 1984. One was from Hardware Hank, a store that still survives to this day in Rapid City and Sturgis, South Dakota. The other was from a now extinct midwest toy store chain called Toy Kingdom. 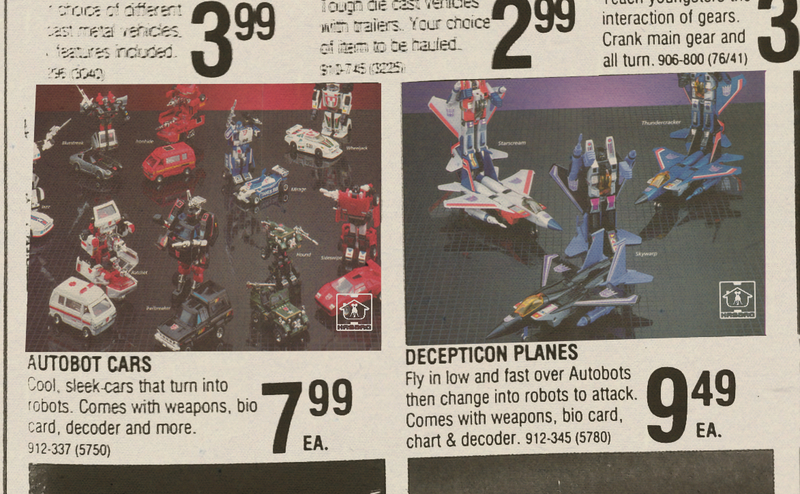 Both of them used the Autobot cars spread in the 1984 Hasbro Toyfair catalog that I'd written about back in 2009. I was familiar with that particular photographic layout so I immediately figured these would be a snap. 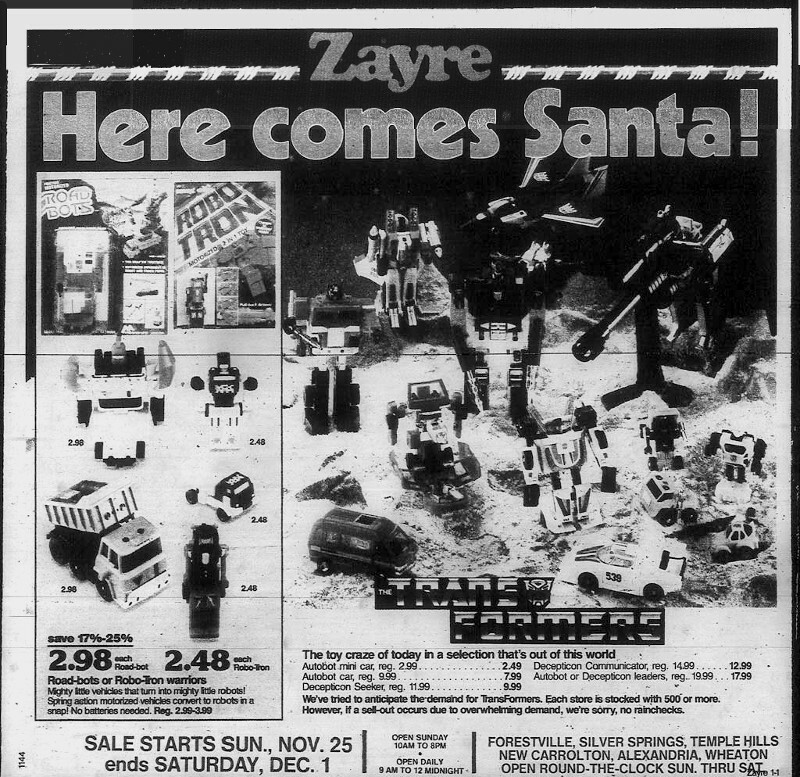 I freaked out royally a couple years back when I first came across Toy Kingdom's November 01, 1984 circular on Google's newspaper archive. 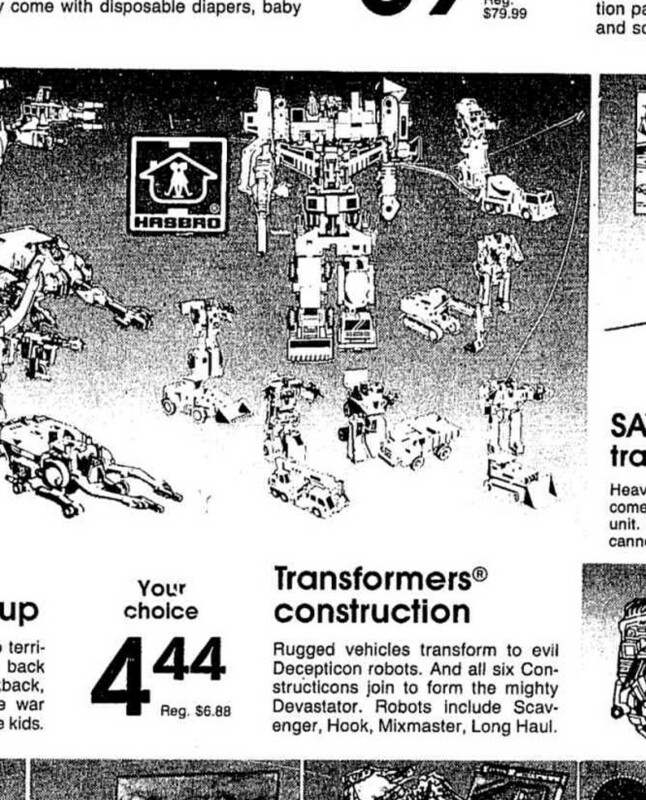 But I only seized upon it that time to illustrate how 1984 Transformers newspaper ad line art originates from photography in that year's Toy Fair catalog. Now that I was trying to color the thing I found there was a lot more to that tiny little picture than met the eye. 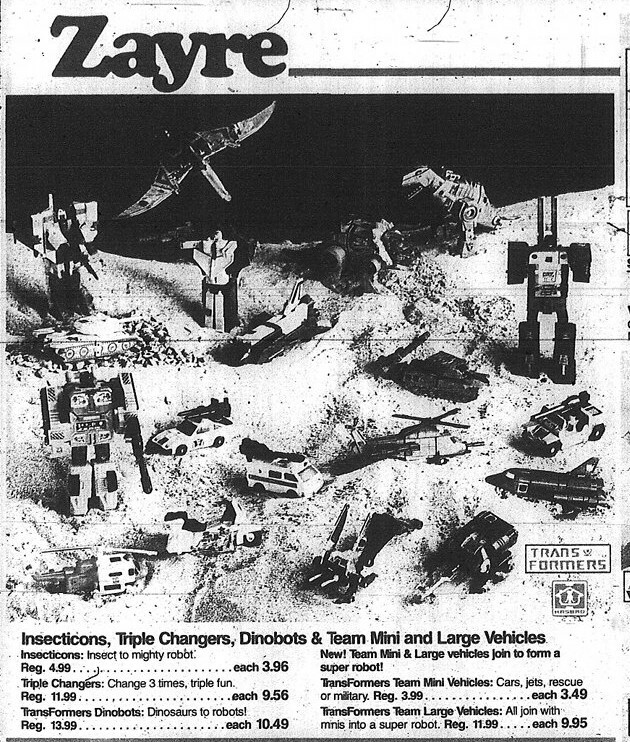 Upon closer examination I think that one ad may be the most historically significant piece of Hasbro marketing material ever published in newspapers, or at least the photograph in it is. 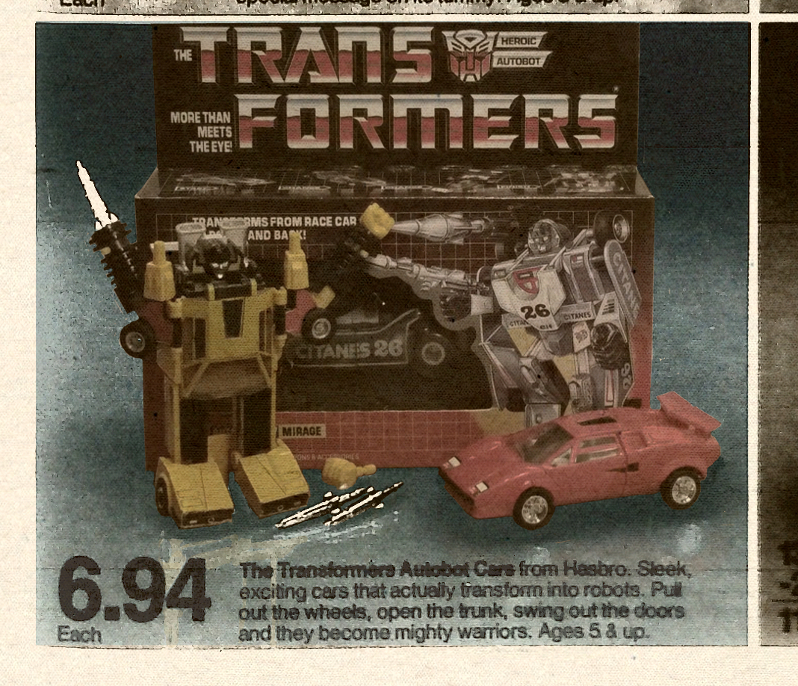 At first glance the small rectangle with the blurry toy images seems to be an exact match with the '84 Autobot car spread. But it actually differs in a lot of ways. 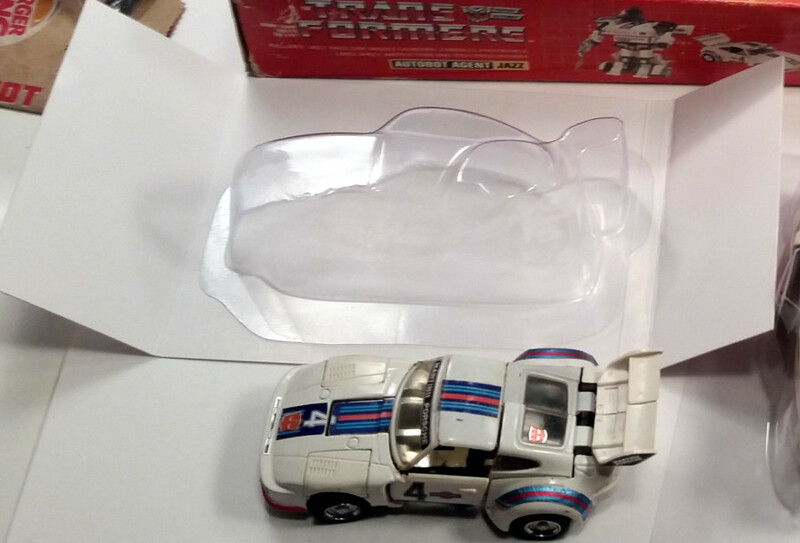 The most obvious is that it does not have the inset rectangle with the Autobot minicars. Instead there is a blacked out area there. The other differences are more subtle but give clues as to what this picture really is. There were no superimposed toy names next to each robot, and the image's southern border extended further than the Toyfair version. 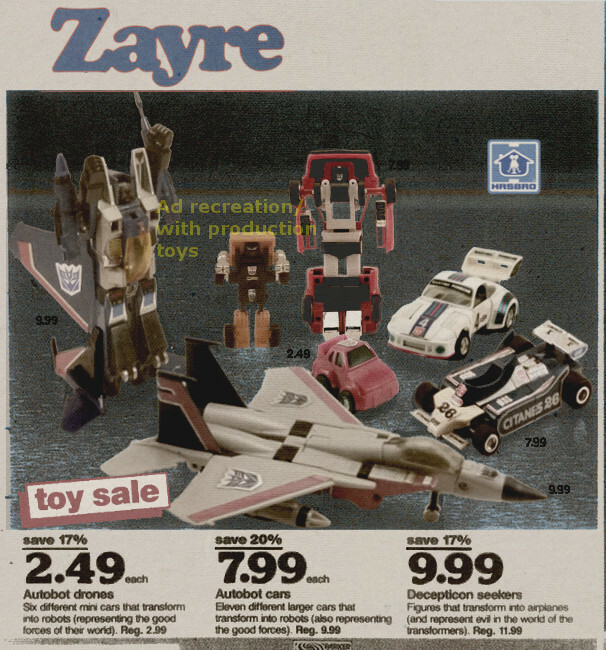 Simply overlaying the Toyfair pages on top of the ad wasn't going to work. 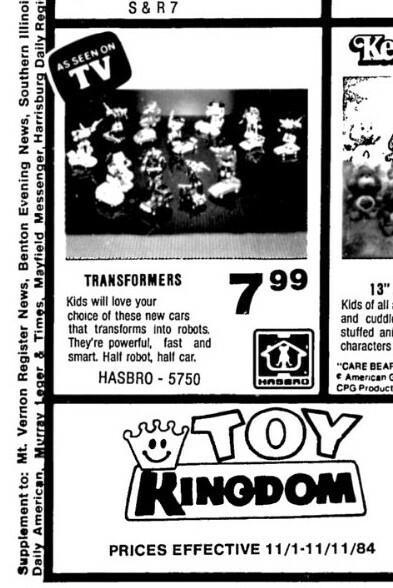 That approach would not produce an exact match because the Toy Kingdom ad was the original uncropped, raw photo taken for the '84 Toyfair catalog photoshoot! 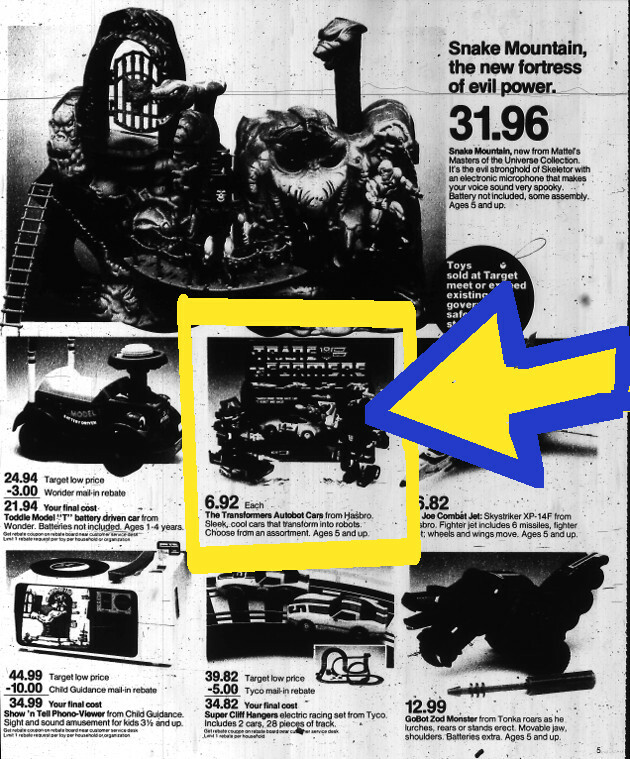 Ultimately the colorization of Toy Kingdom's November 01, 1984 ad fell short because I did not have the original uncropped, unmodified deluxe Autobot car spread from Hasbro's '84 Toyfair catalog. It would be kind of hard to pull that off since I imagine only one of those exists and I don't have the means of acquiring it. For now I am left with a partial color reconstruction and a whole lot of questions any sane rational person would have. How did the Toy Kingdom ad photographer get the image? 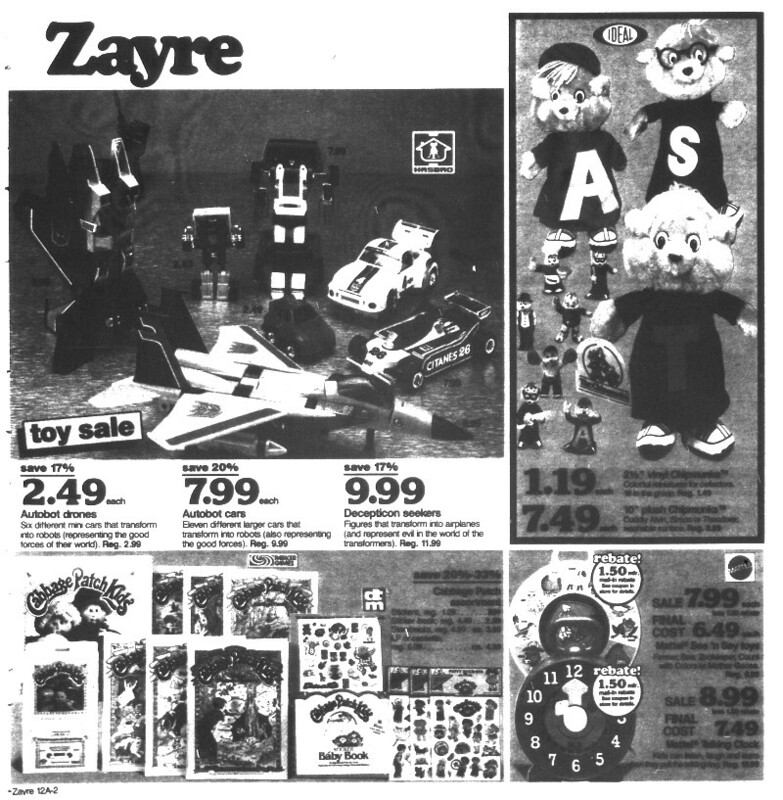 Other stores used the Toyfair catalog as source material, so why didn't these guys do the same? Those will probably remain mysteries to me. I am grateful to have a glimpse of the original picture and were it not for this ad I wouldn't even have thought this much about its existence. However, on the subject of questions insane and irrational, why did they blot out the bottom right hand corner of the photograph? Upon magnifying and level balancing, more details appear in that mysterious dark area. 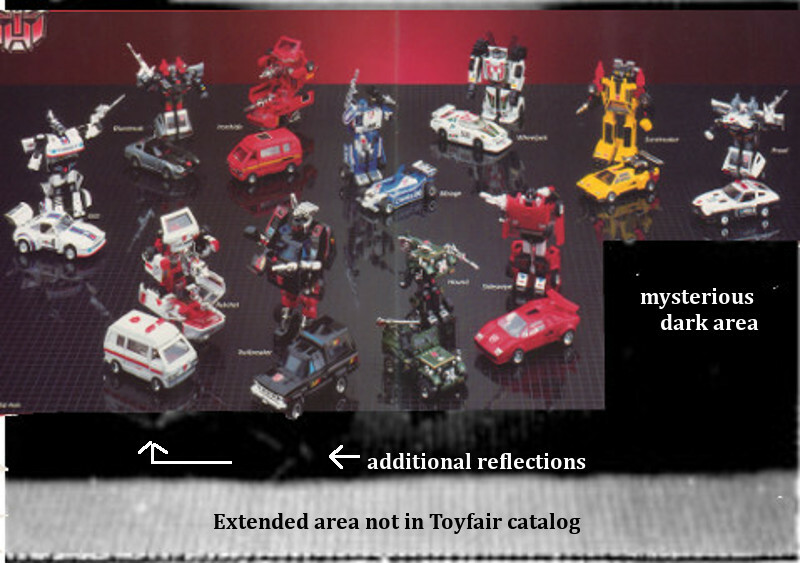 That was the space eventually occupied by the Autobot Minicars sidebar in the Toyfair catalog but this photo was not of the catalog pages, so why did that portion get blacked out? Why not just run the whole photograph with the original dead space there? Or was there any dead space there to begin with? As I was messing with the levels on GIMP I started seeing what I take to be vestiges of an unidentifiable form hiding there in the blackness. 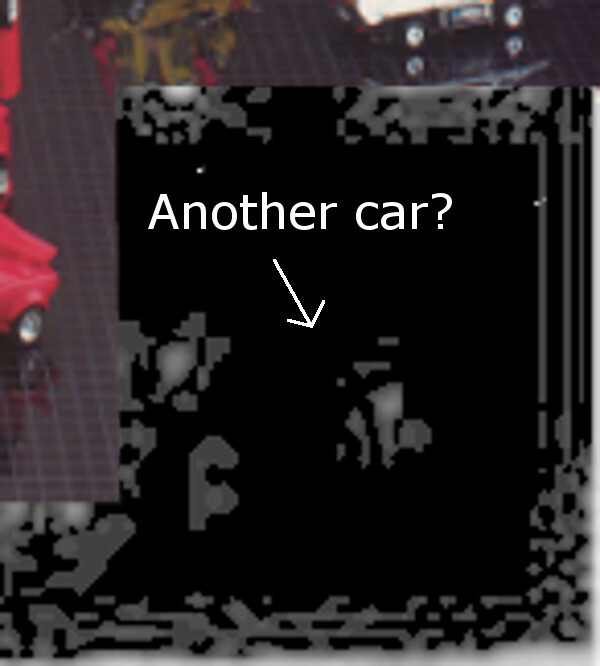 Is it just light glare reflecting off the original surface or could it be an entirely other Autobot car? Am I going crazy here or is there more to this picture? My investigation into this particular image is not yet over. For as long as paleontologists have been unearthing fossils from deep beneath the ground people have wondered, 'What did that Tyrannosaurus skeleton REALLY look like when it was alive?' 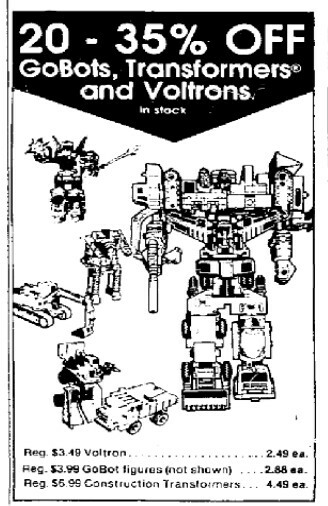 And for as long as I have been digging up old toy robots ads from black and white reels of microfilm I have wondered, 'What did this Devastator giftset ad from 1985 REALLY look like when it was in color?' 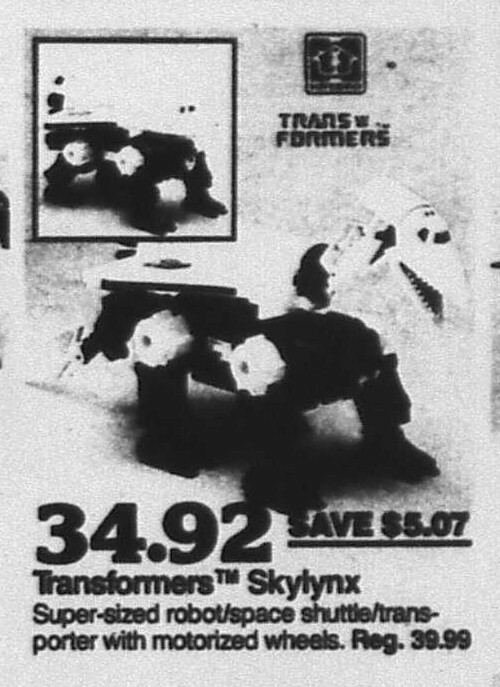 I know it's silly wanting to see ads for toys I already have, but the ads were such a big part of the experience at the time that these monochromatic microfilm slides don't cut it for me. Being in the presence of dinosaur bones at a museum is as close as I'll ever be to a real dinosaur and I appreciate that, but sometimes you just want to pull out Jurassic Park and see a Tyrannosaurus eat a lawyer. 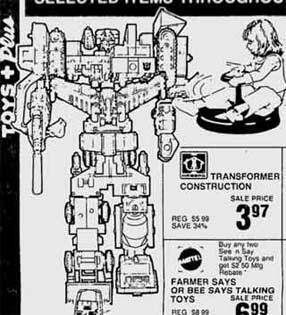 Devastator line art is quite common in ads for the Constructicons as demonstrated above. 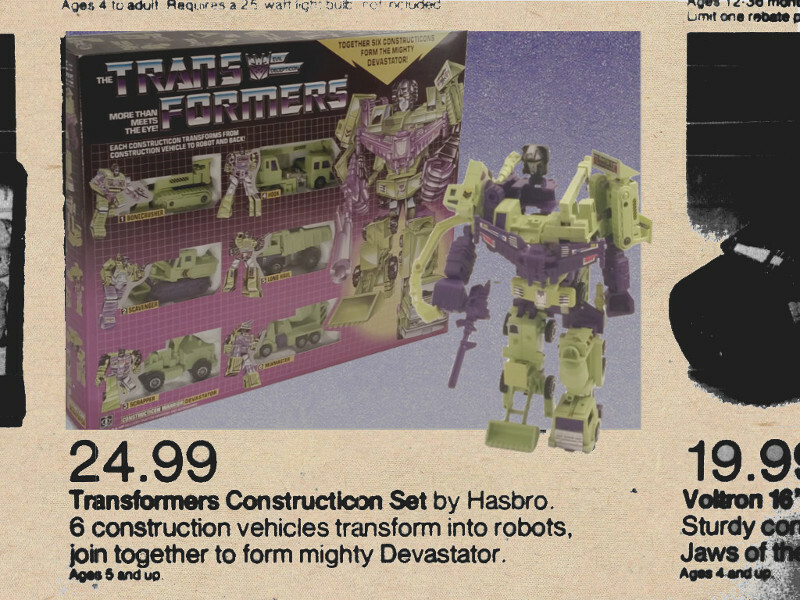 However, most ads it appears in are not for the actual Devastator giftset! 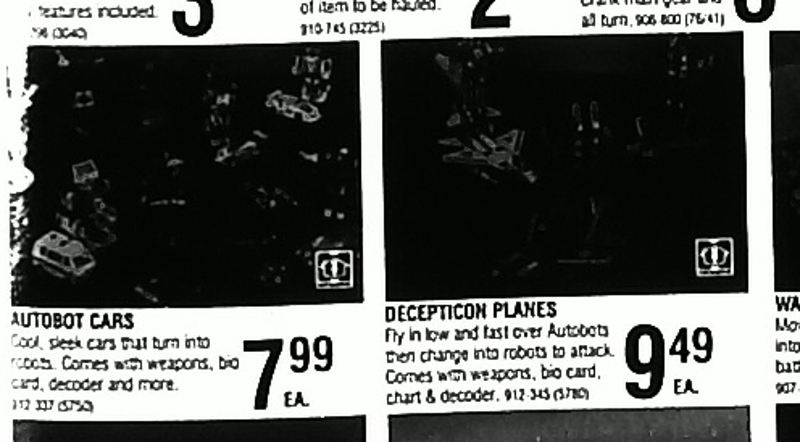 Note the '-tion' misspelling commonly found in Transformer ads where '-ticon' is intended. 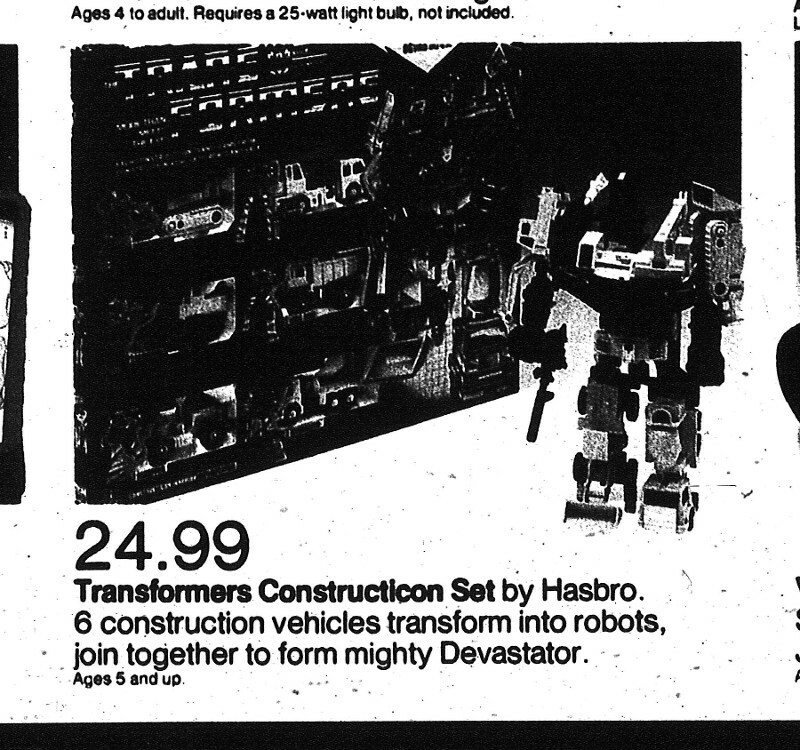 This ad for the Constructicon giftset is unusual in that it uses the Devastator line art. All other ads I've found use pictures of the combined figure and/or the box. Note the incorrectly attached wing and the detached upper torso and legs. 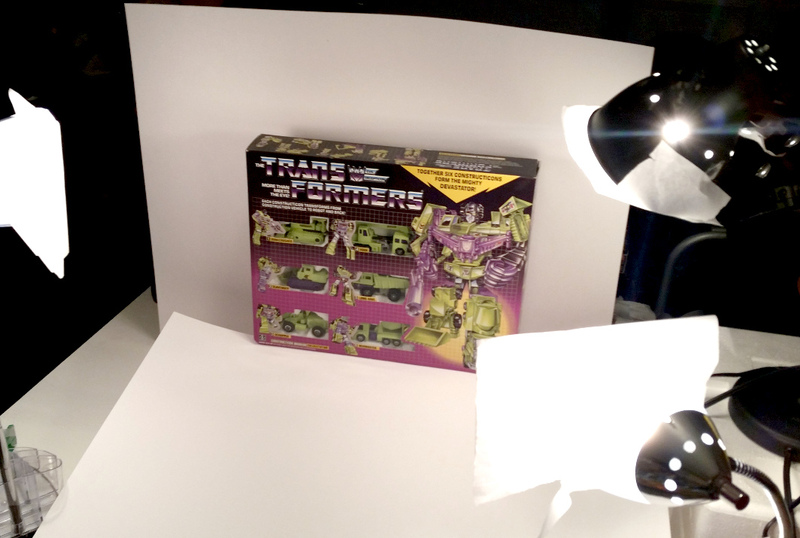 Hasbro apparently did not create 3/4 viewpoint Devastator specific line art so retailers used a version derived from illustrations used in the transformation instructions. 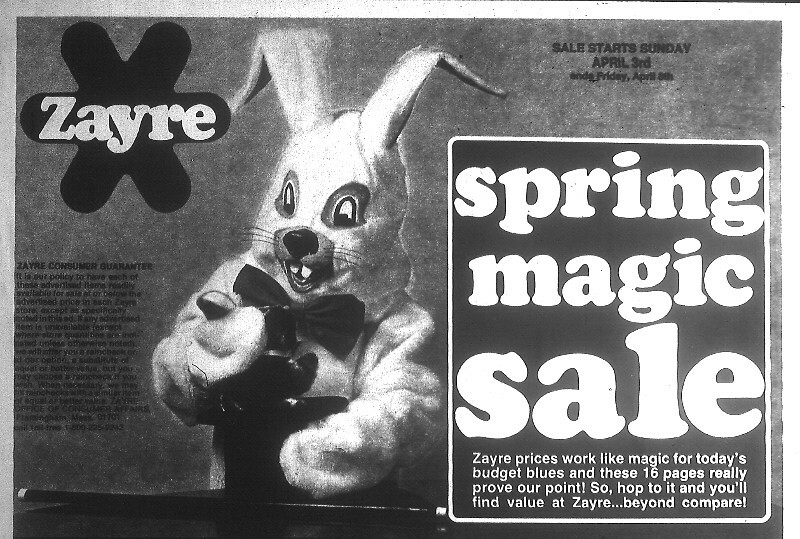 Microfilm works great for preserving the simple line art used in newspaper ads from the seventies and early 80s. Where it fails is in the preservation of color photography, which was used extensively in circulars and fliers starting around the late 60s. 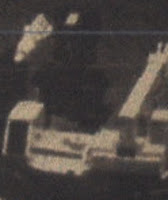 Not only are colors completely gone but most scans of photograph based ads are so badly underexposed it's hard to make out any details. This is true for ads of just about every robot toyline and case assortment I've found but it especially bothers me in the case of Devastator and the Constructicons. 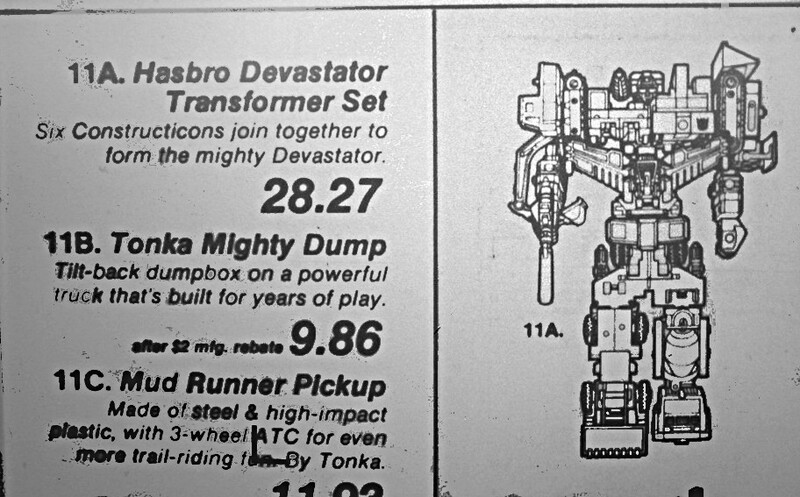 Usually I would be satisfied with whatever line art ads I can pull off microfilm but Hasbro really dropped the ball with Devastator's line art. 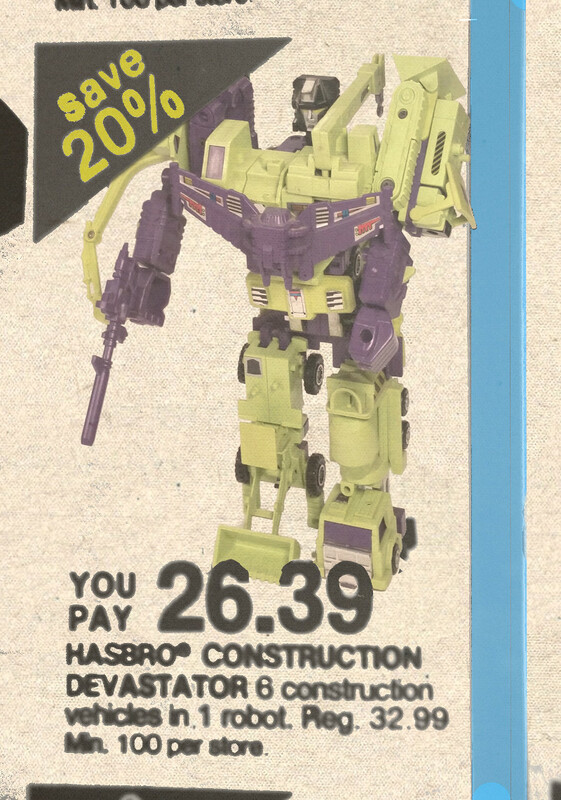 It's as if they were content to use the final step in the transformation instructions booklet which shows the Constructicons just about to combine but not quite there yet, and use that for the repro art they sent to retailers for use in ads. It's horrible. 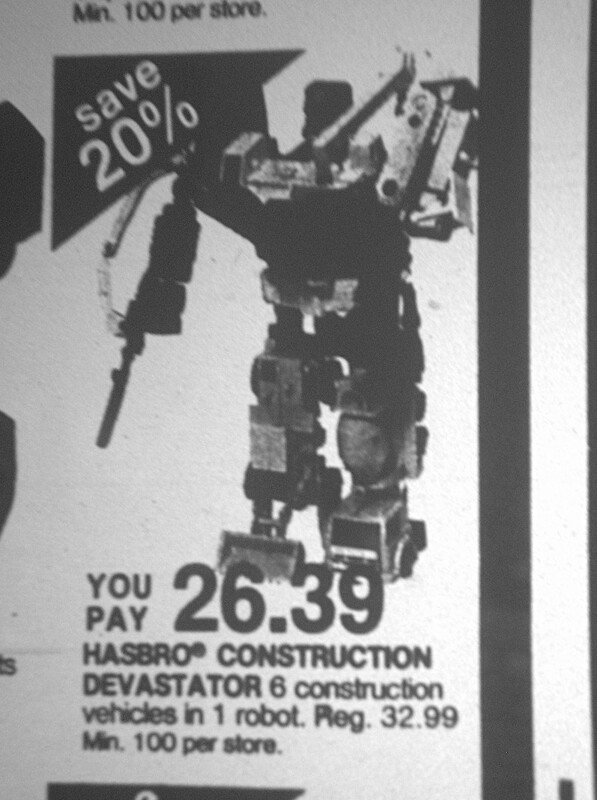 Devastator just didn't get good ad representation except for when retailers took color photos of it for their ads. 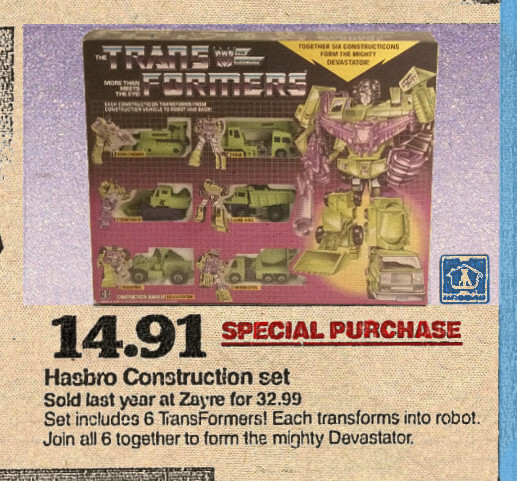 But a nice full color Devastator ad is not completely out of my grasp. I do have at least two options. This ad can be seen in context at the Chicago Tribune. 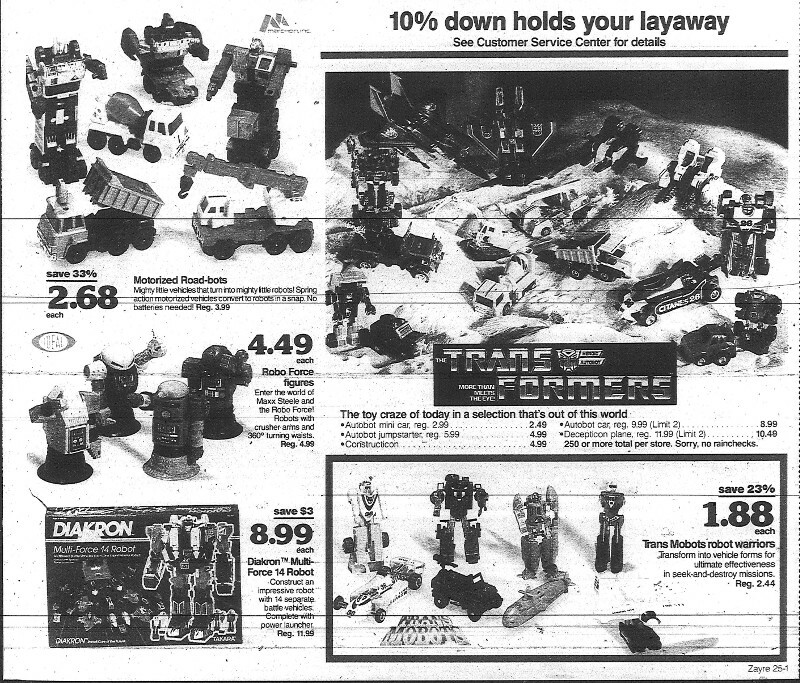 I know of at least three Devastator giftset ads from color store fliers that came out in 1985 and '86 (pictured above). One was from a store called Gold Circle in Pittsburgh, Pennsylvania. Another was in a Target ad I found in Rapid City, South Dakota, and another was from a Zayre ad in Chicago. My first option if I ever want to see these in color is to wait for an actual flier or circular to come up for sale online. Several people all across the country would have to have kept entire newspapers in storage for decades and then decide to sell all of their collections at prices I can afford. Unfortunately the chances of that happening for any one specific ad, especially from the lesser known regional stores are astronomical. The is like hoping a dinosaur still survives in the Amazon somewhere and when you travel to go see it you pray the natives won't scalp you. But then there is a second, more convenient and Hollywood special effectsy option: digital photo manipulation! 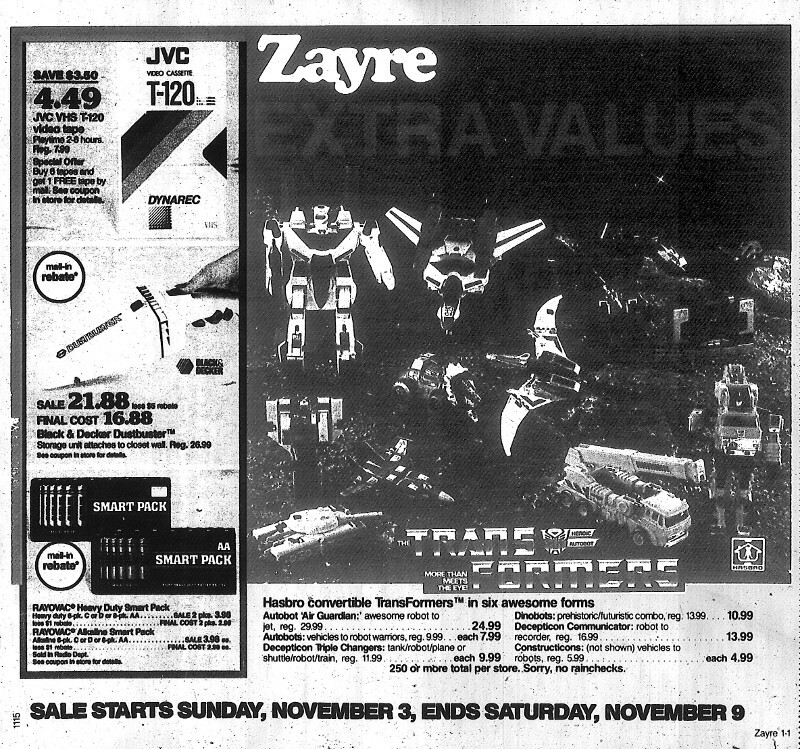 I could take the ads trapped in microfilm like dinosaur DNA trapped in amber and build my Jurassic Park of K-Mart toy robots ads! Close inspection of the Target ad shows the head is placed ON TOP of Hook 's right shoulder peg instead of behind on the waist connector. 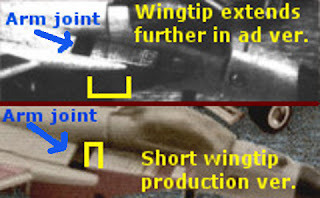 The figure holds together because the chest wing has a tab inserted into a slot in Long Haul's grill. I figured that adding color to some old ads was not outside the realm of possibility for me. 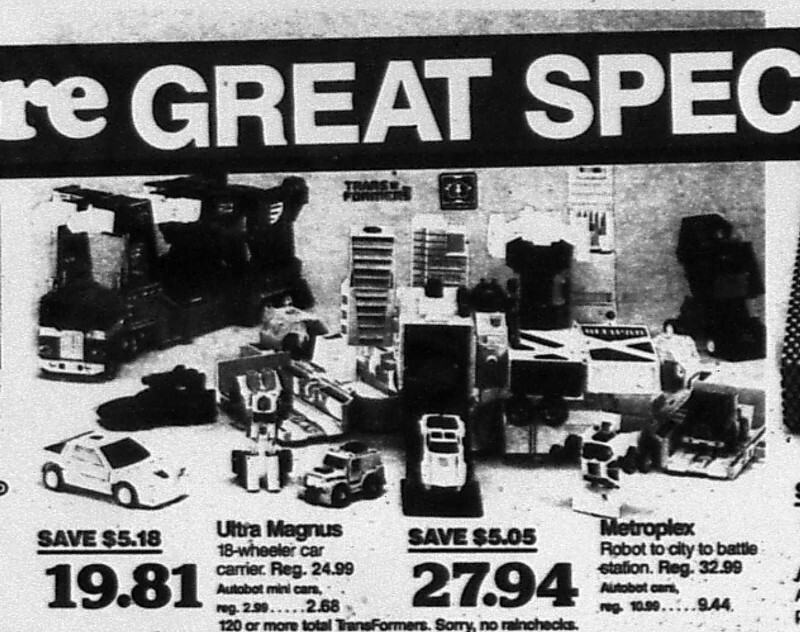 Many times while going through my collection of microfilm ad scans I've thought-hey, I have that toy. How hard would it be to just take a picture of it and digitally superimpose my toy over the ad? As it turned out, it was very hard. If I wanted to replicate the ads exactly I had to figure out what angle the photographer was shooting from and how far away they were from their subjects. Getting everything lit and lined up exactly right is actually extremely difficult. Thankfully I was able to get satisfactory results with some distortion and perspective effects in the photo manipulation software I was using. (aka: cheating) Then there was the question of exact replication or idealized recreation? I had to ask myself how true to the source ad I wanted to get when recreating the scene-should I mistransform my robot the same way the photographer did? Should I leave accessories out like they did? I decided I wanted to recreate the ads as closely as possible so I tried repeating all the same mistakes the photographers made. It was actually kind of fun that way. 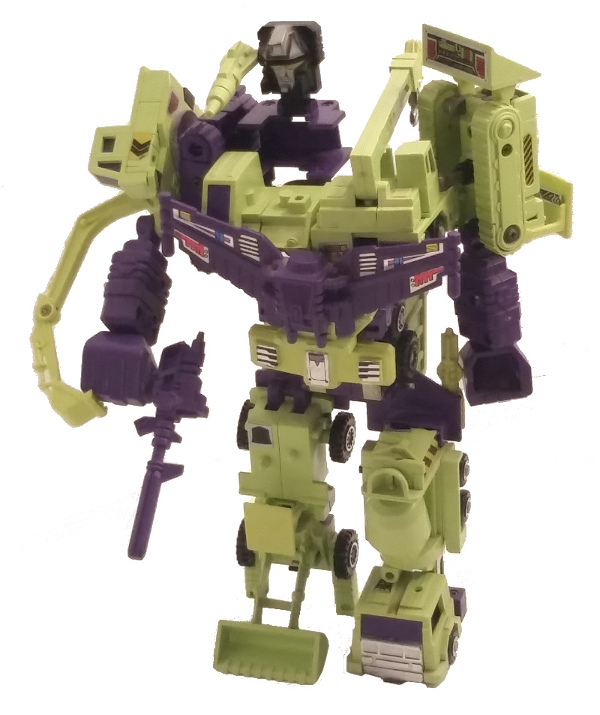 I didn't even know it was possible to transform Devastator without his head connected to Long Haul! How did that Target guy even do that? I was pretty happy with how the ad recolorizations came out. There are some obvious tells that give away their being digital manipulations but the point of the exercise here is to get in the ballpark. My wife and I got into a discussion about the ethics of doing this because she works in the media and is very conscious of her responsibility to be accurate and factual with photos. I don't believe there is much to worry about because we're not talking about recoloring old movies or bringing velociraptors back to life here. Still, she raised the point that Devastator's arms may have been black in one of the original ads instead of purple like the production toy I used in my photos. So I may be glossing over details that are important from a historical perspective to Transformers historians. I suppose that's true but we'll never know until the original ad pops up, which is unlikely to ever happen. She wanted me to use watermarks and disclaimers and all sorts of other heads up about the manipulation of the source material. I didn't think I needed to go that far. In the meantime my personal policy will be to not include these over at my online ad archive. But I will include them in blog posts here where I'm on the same page with my audience and we all like looking at these old fossils of a bygone era when Dinobots ruled the earth.